I READ the article by Eddie Barnes “Human rights row over salmon” (News, 8 September) and was shocked by comments attributed to Paul Wheelhouse MSP, Scottish Government Minister for Environment and Climate Change. How can the minister for the environment possibly believe “we must continue to look at ways of sustainably growing” the salmon farming industry? What he should be doing is stopping expansion of the industry while we still have a few sea lochs which are not blighted by the presence of floating factory fish farms. 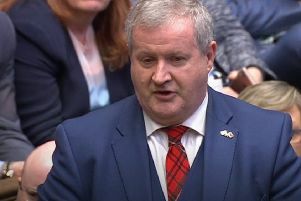 First Minister Alex Salmond, Cabinet Secretary for Rural Affairs and the Environment Richard Lochhead and the minister for environment and climate change suggest salmon farming is sustainable. It is not. Tonne for tonne the industry uses more wild fish as salmon feed than it produces finished product. Salmon farmers rely on chemicals and additives to medicate, colour and delouse their stock. Salmon farms are a source of pollution which damages the seabed around farm sites. Government licenses the shooting of seals by salmon farmers who cannot be bothered installing seal exclusion nets. Alex Salmond and his ministers should hang their heads in shame for encouraging the expansion of salmon farming and colluding with Norway to con the Chinese into buying what is basically Norwegian salmon with a tartan tint. China banned the import of Norwegian salmon after Norway gave the 2010 Nobel Peace Prize to a Chinese dissident. Two-thirds of salmon farms in Scotland are Norwegian owned. Last month I did a stock check in a supermarket in Argyll, a county with a large number of salmon farms. All of the fresh chilled salmon on sale was from Norway. Are the Norwegians selling their home-grown salmon here while their Scottish farms are busy supplying the Chinese market? The way the Scottish Government has bent over backwards to appease the Chinese is disgraceful. Allowing the degradation of the Scottish marine environment while acting as middle-man for the Norwegian salmon producers who are profiting from this trade is unforgivable. SHAME on the SNP for selling Scotland’s family silver off on the cheap to China. The SNP seems hell-bent on mortgaging Scotland’s future to underwrite a disease-ridden salmon farming industry which is ethically and environmentally bankrupt. Draining our oceans of wild fish to feed to farmed salmon for export to the Far East is a false economy of ­Ponzi-size proportions. By sanctioning a 50 per cent increase in salmon farming production by 2020, Scottish ministers are selling Scotland’s wild salmon down the Yangtze River.